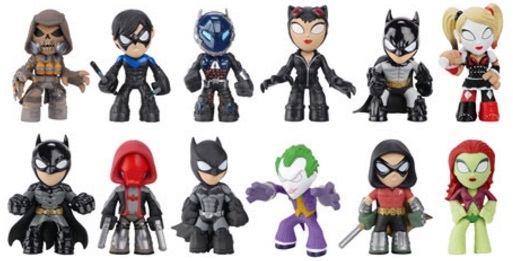 Shrinking the Batman: Arkham subjects down even more, the 2015 Funko Batman Arkham Mystery Minis join the earlier series of Pop! figures for the popular video game franchise. Featuring 12 different figures, the Funko Mystery Minis product is issued as a blind box release, meaning that the individual figures are unknown until the box is opened. This adds a chase aspect, similar to sports cards, where it can take some luck to track down the full set on a box-by-box basis. 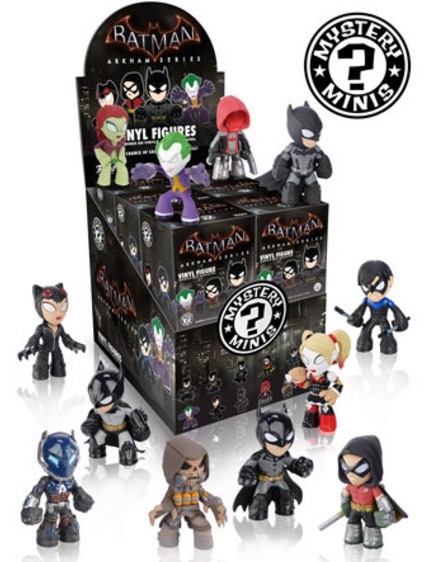 The full line includes familiar names from the video game story, including Joker, Catwoman, Harley Quinn and three figures for Batman. Figure rarity is currently unknown, but with 12 figures in the set and 12 figures per case, it is possible that they all fall evenly. Already consisting of several titles spread out of several years, check out the figure origins with the Batman: Arkham video game options on Amazon. Lot of 27 Funko and others Mini Figures Marvel Batman Superman plus others look!